## ElPancho's UK Roadtrip ## FIVE cabs in one go !!! Dragon's Lair Fans - Arcade Lifestyle > General Chat > Arcade Lifestyle > ## ElPancho's UK Roadtrip ## FIVE cabs in one go !!! A while back my brother and I came in touch with a collector in the UK. collection. We are interested in: Pac Man, Donkey Kong, Astroids, Mappy and Paperboy. We had to ask: Do you have a Dragons Lair (II) or Space Ace or any laserdisc games ? But unfortunately that wasn't the case. We make arrangements for saturday june 23 to collect the games. And just like all the hardship Bruno has to endure ;-) we too are facing a 1100 kilometer long trip. We decided to leave a day early and head for France (Calais). sure that the truck has a tail lift. 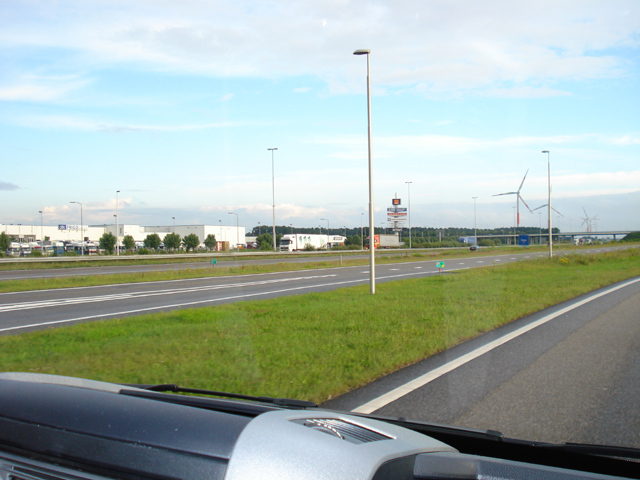 Here we are a few hours later, almost leaving Holland. sun and rain in Holland. At 22.15 Friday night we arrive in Dunquerke (Duinkerken if you speak Dutch ;-) to stop for the night. F1 hotels are everywhere in France. More F1 later on. The next morning we wake too early at 06.00. No problem: we have a boat (or is it ship) to catch. We have reservations for 9.30, check-in at 8.00. We arrive at the ferry at 07.45 and are allowed on the one leaving at 08.00. That’s a great way to save time. After disembarquing and after a 2 hour drive we are closing in on Bracknell where the seller lives. And by now we are starting to realise the Ascot races are due today, so we might run into some “jet-setters”. A few minutes later we are at the sellers place. The garage doors open for the first time. I agree shame it’s hard to tell what machines they are. Q-bert and Dig Dug well, thats easy. Behind Q-bert is Centipede. To the right of Q-bert is, I think Tempest. Mappy is to the right of Dig Dug. Now we are talking so much about games the next time I take a picture, Astroids is already in. Out comes the second cabinet, Mappy, fine game, and a fine tune to it, I think. The one on the right is Paperboy. Side art is missing and was painted over in……black. On the way back to the ferry we run in to some F1 related vehicles. Here we are back in France, slipstreaming behind a truck. We’re running out of diesel and no gas-station in sight. Made it  0.3 liters left. Unloading the games in Holland the next morning. Without my brother Reb this roadtrip would not have been possible, thanks man, you rock. Yep, Astroids is working 100 % Little burn in on the screen. Side art is original and almost mint. Allmost everything was for sale (Everything if the price was right). Misschien kunnen we elkaar later nog eens tips geven. Thanks for your tip and offer to help. I immedeately surfed to your site to read (once more ) your story on your Astroids cocktailtable. The tut is also hosted here by Bruno if I'm not mistaking. Problem is: we might not have the time to work on Astroids. What's the worst that can happen if we do nothing for a few months ? Since my parents live nearby I'll dorp by just to check on Astroids once again. Take some pictures aswell. Maybe the previous ower did some work on it. I know he did a lot of work on all his cabinets as he is a technical engineer. When we picked it up I made sure the components were genuine (the best I could). I didn't look for cap-kits. Thanks again for offering your assistence. When Astroids needs to be fixed in a more timely fashion, we'll get on the case. after looking at the picture i will give you more advise. The think is to get some part to prevent failure in the futur, changing the BIG BLUE is always good, and moding the psu prevent to send higher voltage to the pcb and damage it. Re: ## ElPancho's UK Roadtrip ## FIVE cabs in one go !!! I know it has been a while ago but i was wondering if you still got the DK cab? I am also from the netherlands and searching for a long time for a DK or Pacman. But do you want to sell it to me ? and what kind of price do you want for it? I do also understand if you want to keep it. Nope, he hasn't. I know for a fact because I bought the DK from Onno in October 2009. Oh boy, has it been that long ago already? 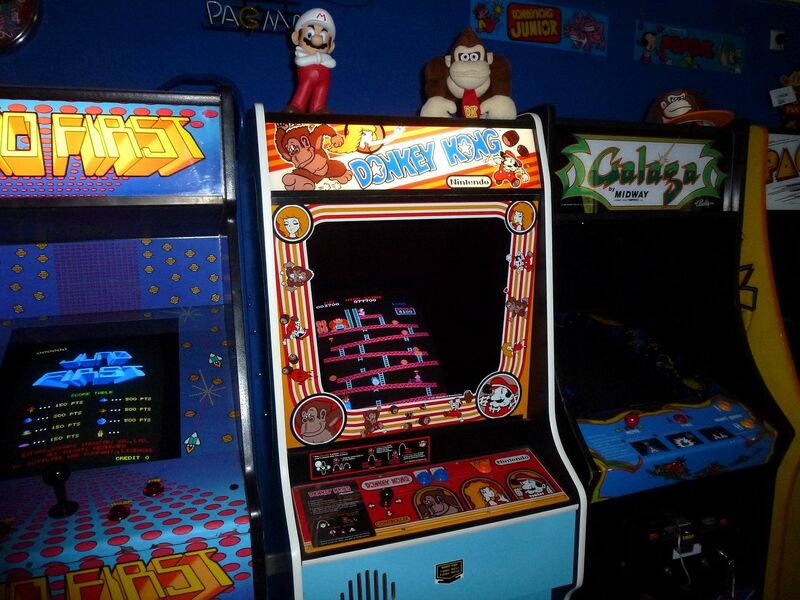 DK was my first classic cab and I still think that it's the best game to have in a classic game collection, together with pac-man, Galaga, centipede, asteroids, ...... and hundreds of other great games. Never saw this road trip report, thanks for 'updating' the topic.